Like the women of Peru, I carried my babies and toddlers on my back. I shared this joy with my, now, closest friends. 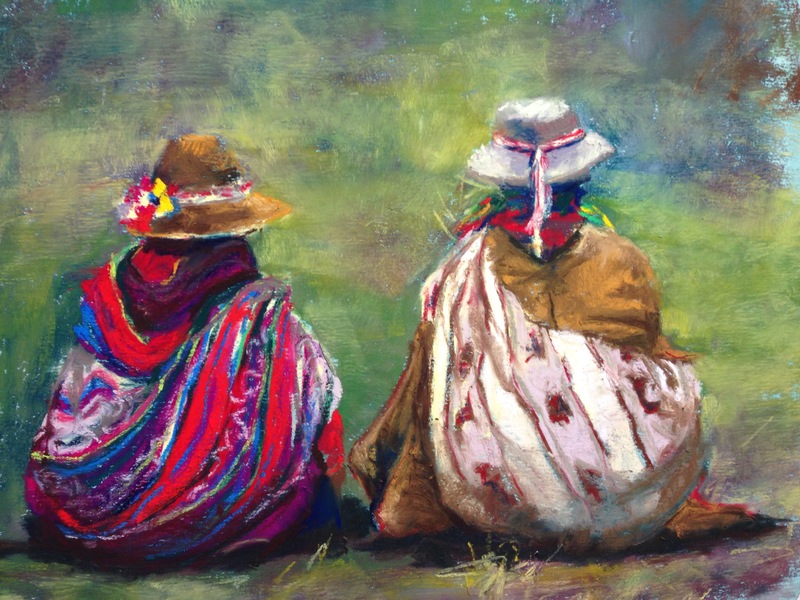 The women sitting in this painting don’t have babies on their backs, but like many Peruvian women, continue to carry heavy loads on their backs long after their babies are off on their own. As I have just completed a long backpacking trip, I know exactly how delightful it is to offload something from your pack to someone who is capable of handling the extra weight. As I painted this, I thought of my friends, and the loads they are currently carrying: a fight with cancer, a miscarriage, financial problems, and a long and varied list of problems from the babies fledged from our backpacks. The hills we sit on to share our burdens usually look like cell phone calls, and shared loads always become easier to manage. Wonderful painting, I love all the vibrant colors. My prayers are with your friends in need. Love the colors, the positioning of the women and the fabric. This one is beautiful. You have captured the colors of the beautiful textiles so wonderfully. Love the painting and insights. Thanks for sharing, and blessings of support and prayers to all of our loved ones in need! Love the painting, ur insights and perspective. Blessings and prayers to all in need of support today! As soon as I saw this one, I thought about the stories they must have shared and loved it… then of course, I read your sentiments and the tears roll… thankful for the wonderful opportunity to have friends that you love so much that you hurt for them and with them.